It appears that Eric Tsang’s (曾志偉) upcoming television drama for TVB, Aerobic Girls, has found its male lead! 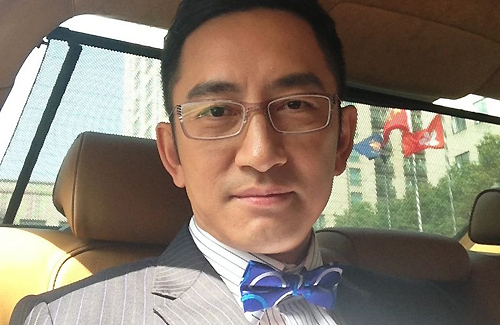 Lawrence Ng (吳啟華) is reported to be in deep discussion to join Eric’s high-budgeted series, a television comedy drama about a group of middle-aged women who are reunited with their high school friends. Should he sign on, Lawrence may star alongside Flora Chan (陳慧珊), who is already in final negotiations with TVB to star in the big production. The growing star-studded ensemble may also include Sheren Tang (鄧萃雯) and Teresa Mo (毛舜筠). Meanwhile, Eric is attempting to convince Veronica Yip (葉玉卿), who recently made a comeback in the industry to star in Eric’s I Love Hong Kong 2013 <2013我愛HK 恭囍發財>, to return to star in Aerobic Girls. Anita Yuen (袁詠儀) was also considered, but due to schedule conflicts, she had to turn down Eric’s offer. Charmaine Sheh (佘詩曼) disclosed earlier that she was also in talks to take part, but due to her younger age, she may not be suitable to star in a major role. Aerobic Girls is a rough adaptation of the 2011 Korean film Sunny, a drama film about a middle-aged woman who tries to fulfill her friend’s dying wish by reuniting their group of high school friends. The film was South Korea’s second highest-grossing film of the year, and the 13th highest grossing Korean film in history. Eric announced that a casting audition for Aerobic Girls will be held in mid-April for the female leads to select their high school counterparts. The selected cast will be announced as soon as the auditions are finished. OMG can’t wait! Am dying to see Flora again and she would make an awesome couple with Lawrence. Let’s hope this news is true! Agree. It will be a good and solid cast ….. Sheren Tang, Teresa Mo, Flora Chan and Lawrence Ng. Sheren and Teresa are excellent actresses. I loved Sunny! And I’m loving the sound of this cast. This will definitely be worthwhile to watch. When Lawrence was casted to act in thc 2, tvb said he will be paired with a “heavyweight well known” actress. Whatever that girl’s name is, she’s not a heavyweight. Not that well known either. Last year Eric said he will ask Andy Lau and chow yun fat to film a series, what happened to that? Let’s see if this is another bs made up for publicity. That goes to show that Lawrence is simply regurgitating the information that TVB is telling him. For THC2, I’m willing to bet that initially, the female lead that TVB was looking to secure truly did meet the 3 ‘criteria’ that Lawrence revealed (which is why he said what he did), but for some reason, that person probably didn’t end up accepting – then, when Louisa So was brought into the picture, I thought for sure that she was the one, since she actually DID meet the ‘criteria’ in a sense (though I guess the ‘heavyweight’ criteria can be debated, as some people may feel she’s not really a ‘heavyweight’ actress)….but then it turns out she’s only in a supporting role and not pairing with Lawrence at all. I’m pretty sure even Lawrence himself didn’t know that the casting would turn out the way it did (since TVB ultimately is in charge and his knowledge is only as good as what they tell him). This is why I absolutely get annoyed when TVB (and the Media) ‘jumps the gun’ and starts ‘leaking’ all this information out prior to anything being confirmed. What’s the point of doing this, since it’s a ‘no win’ situation for both sides if the collaboration doesn’t work out? The only 2 reasons I can think of are: 1) they ‘leak’ this stuff out as a means of publicity / hype for the series – so basically, it’s pretty much a ‘publicity stunt’; and 2) it’s a tactic employed by the company (TVB for instance) to ‘force’ the artist(s) to accept the offer, since all the pressure from the Media (and the audiences / fans) definitely does have an impact (take Francis Ng for example – part of the reason why he agreed to return to do TITS2 was because of audience pressure – he initially wasn’t going to film the sequel because he doesn’t believe in doing them, but then everyone kept pestering him about it and because he felt the audiences really wanted him to return to film the sequel, he gave in and did it). I believe “the heavyweight” actress was Ada, but she couldn’t film it due to a schedule conflict. I would see why Lawrence was tempted to film THC2. High budget and a solid cast but the plot is still a remake of a Korean production? TVB are not even trying these days. Remember the days when the HK market was the industry leader? Now TVB is a follower and they don’t even do that well. Advo, you hit the right point. It’s sad that all TVB do now is to plagiarise with remake or churn out sequels after sequels. I’m watching the older productions like duke of mount deer now and they rocked. Back in the days, TVB also did not have much competition like these days. Back then, China only made a few classic series, Korean series did not exist yet, Taiwanese series were not that popular, ATV made some series but were not as popular as TVB,etc… so TVB did not have to worry as much. They also did not make and produce that many series like they do now. Times have changed and after sooooo many years of making series, they are bound to run out of ideas so have to get new ideas from somewhere. They also can’t adapt JY anymore, but I wonder why they don’t do Gu Long, Liang YU Sheng and novels from other authors. They can also do other historical novels that have not been done in awhile or produce better adaptions since China is making a joke out of many of them these days… I wonder why they have to resort to borrowing ideas from Korea?? But then again, that isn’t too bad since people have been borrowing from each other from a long time. Many Taiwanese series are adapted from Japanese manga and I don’t see the big deal as long as they got permission. One thing: Txb wuxia series failed recent years. Audience dun like to watch wuxia. So they dun adapt wuxia novel anymore. And its crazy that Txb always too creative when adapting. Look at wat happened to the latest novel adaption The Four. The cases are own creation and they are boring. When they adapt things, they are over creative. When they deny they are adapting, they copy and do plagiarism. Btw, Korean series also borrow ideas or adapt mangas. Hehe, it isnt too exaggerating too say that mangas are wonderful with many many ideas. How many two mangas with similar content? @advo: So true! TVB has definitely been taking the ‘lazy’ route when it comes to their productions. As I explained in my blog post just this morning, why should TVB even attempt to do a good script when (according to them), audiences could care less as long as they cram as many ‘well-known’ and ‘popular’ stars in a series as possible? There’s a reason why TVB’s strategy in the past decade (and beyond that too) relies heavily on getting previously popular artists to come back and film series for them (ok, there are several reasons why, but one in particular sticks out)…. I wonder if the format would be like “When heaven burns” with flashbacks to their childhood years or where it shows them as high schoolers first then move on to the adult transition. Hope this new is true! Amazing casts! I don’t want to get too excited when nothing is confirmed yet. Lets just wait and see. It sounds like an interesting plot. Hope that this is all true. I would love to see them all together again. Why do think that Charmaine is too young? She is 37 already,unless they are comparing her to the veteran actors and actresses. You think so?? I think Charmaine looks her age if not older. She has very mature look to me. Even though i’m a charmaine fan, i’ve to admit recently she seems to look older. Its probably her hairstyle, its too short. I miss her long hair. I would love to see Lawrence vs Flora again. I really miss them as a couple. Lawrence still keeping good above picture. It should be a good drama series with such a strong cast. However, it should NOT be produced/directed by Eric Tsang. I don’t like any of his movies/drama series. They were all silly and stupid ones. Anyone know why the series is called Aerobic Girls? TVB always change the names of their drama series again before airing time, e.g. Detective Columbo to Bullet Train. Because TVB doesn’t want to use the actual title; Robotic Girls, to reflect the actresses in this series perhaps? Or most probably Anemic Girls since most look starving? Or Exhausted Girls? You mean after all the oohs and ahhs and I will rescue TVB stuff, we have a series called …Aerobic Girls? Why does it sound like a movie that Wong Jing will do? All the TVB uncles should ‘retire’, in the 80s and 90s, you won’t see those late 40s, and over 50s still getting prime slots on TV. How did Tony Leung, Andy Lau, Michael Miu, Jaime Chik, Dodo Cheng, Chan Mun Yee etc get famous in the 80s? Because they are young, handsome and beautiful. And yes, ‘young’, being young in their mid 20s can already gave them fame during that era, now the poor youngsters had to slog at least 10 years to get somewhere, all opportunities blocked by uncles and aunties! I think Tony, Andy, Jamie and others from the 80s had talent as well and did go through training as well when TVB still offered acting training. Unlike many of the artists of today who at times have never acted in their lives but just get thrown into it and just have to fend for themselves. Agree. Also TVB does not promote artistes under age 30. They don’t want them to become famous and switch to film movies (more money and not as long hours). They learned their experience by losing Tony Leung, Andy Lau, etc. Aerobic already past its use-by date, no more a fag, why still use aerobic as the theme??? It’s a rough adaptation of the film Sunny. They had dancing, so this one apparently has aerobics… It may not be the in thing now, but it seemed quite popular in the past; the key thing is to evoke memories of their younger selves. Perhaps. Hope Lawrence wont be involved with any Txb kids with crazy fans in this one. how long must tvb rely on aging actors and actresses to pull in the viewers? time to develop the new ones. Newbies in TVB cannot act, my dear young kid! That should never be the reason why TVB should not develop new ones. I think TVB needs a new approach in developing actors/actresses in the younger generation, perhaps have a couple of acting sessions. Learn the mechanics, the fundamentals and then step in front of a camera. The aging actors and actresses can hold up only for so long. In the short run, they’ll pull in audiences, but in the long-run it’s going to be the same story. They’ll crash.